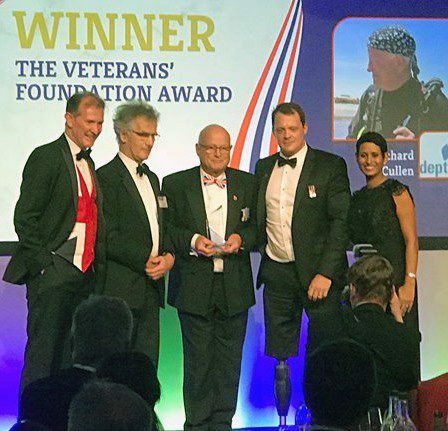 Diver and Deptherapy Chairman Dr Richard Cullen has seen his work recognised in the form of the Veterans’ Foundation Award at the Heropreneurs Awards – an honour that comes with a £10,000 donation for the scuba-rehabilitation charity he helped to found. Deptherapy uses scuba-diving programmes to help rehabilitate UK armed-service personnel and veterans who have suffered life-changing mental and/or physical challenges. “The Heropreneurs Awards recognise the outstanding achievements of anyone who has served in the armed forces, and their dependants, in the world of business,” said Peter Mountford, Chairman of Heropreneurs. The presentation, made at a ceremony in London, follows the recent announcement that Deptherapy team-member Josh Boggi had been nominated in the Royal Foundation’s 2019 Endeavour Fund Awards. Fellow team-member Ben Lee won an Endeavour Fund award earlier this year. Next year’s winners will be announced on 7 February. Through Deptherapy’s continuing education programme, Boggi last month became the world’s first triple-amputee PADI Rescue Diver. The former Royal Engineer had started diving in 2016 and joined Deptherapy the following year to qualify as an Advanced Open Water Diver. He gained further experience on an expedition to Truk Lagoon with the charity before taking on his biggest challenge in the Red Sea. “It was physically and mentally hard, and at times frustrating, but I managed to adapt and overcome all the challenges that were thrown at me and I passed!” says Boggi. “Becoming the world’s first triple-amputee PADI Rescue Diver is great but not why I did it – I wanted to further my diving education and become a better diver. “The ocean terrifies me; every time I go under water I think I am going to be attacked by something bigger than me, but this is exactly why I do it. It takes me out of my comfort zone and puts me in a position where I am constantly being challenged.